Who Is Forging The AD72**** Machines? 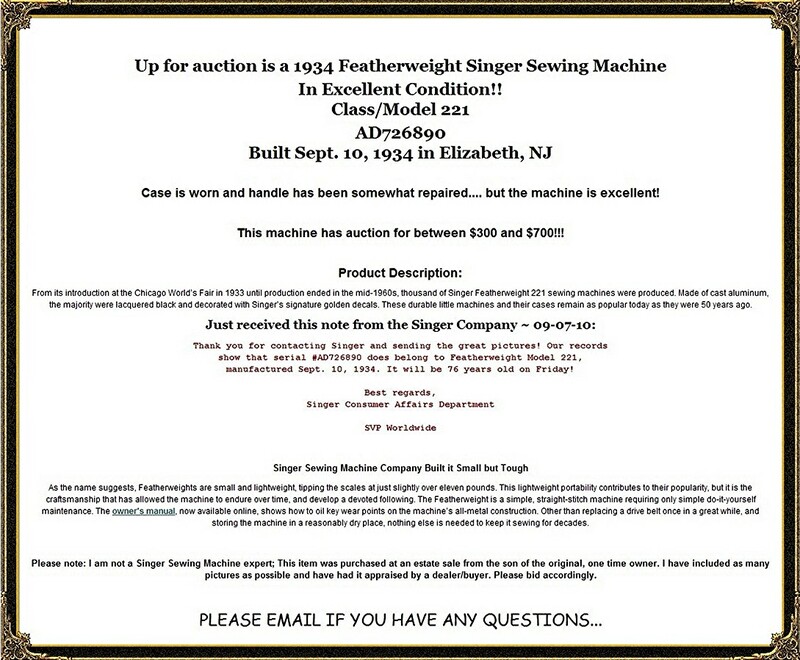 Three Featherweights with forged serial numbers have been sold on eBay in recent months, prompting us to wonder who is up to no good and, more importantly, to warn Featherweight buyers that they may be cheated without careful examination of what they are buying. The three machines that we have noticed had the following serial numbers: AD721468, AD721836 and AD726890. 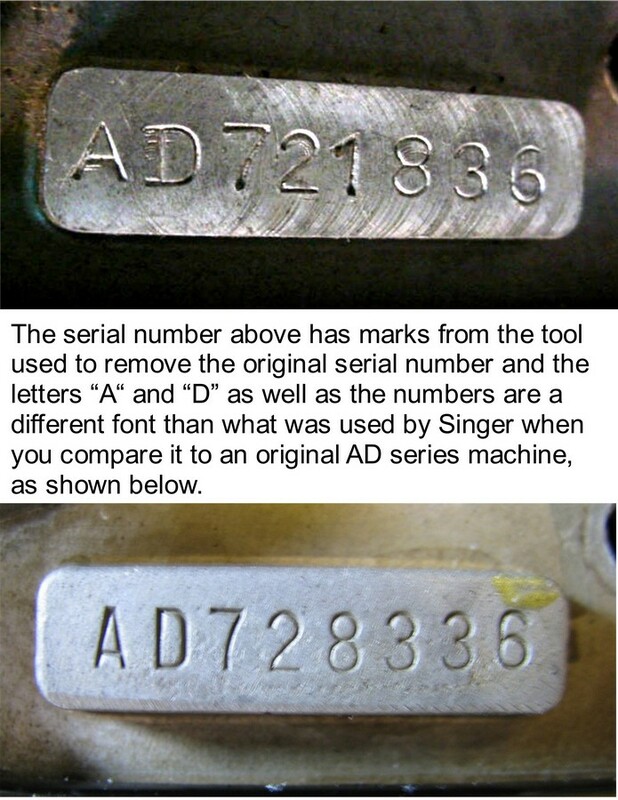 The first machine, AD721836, was noticed sold on eBay on June 17, 2010, but unfortunately the only evidence we collected was a photo of the forged serial number. 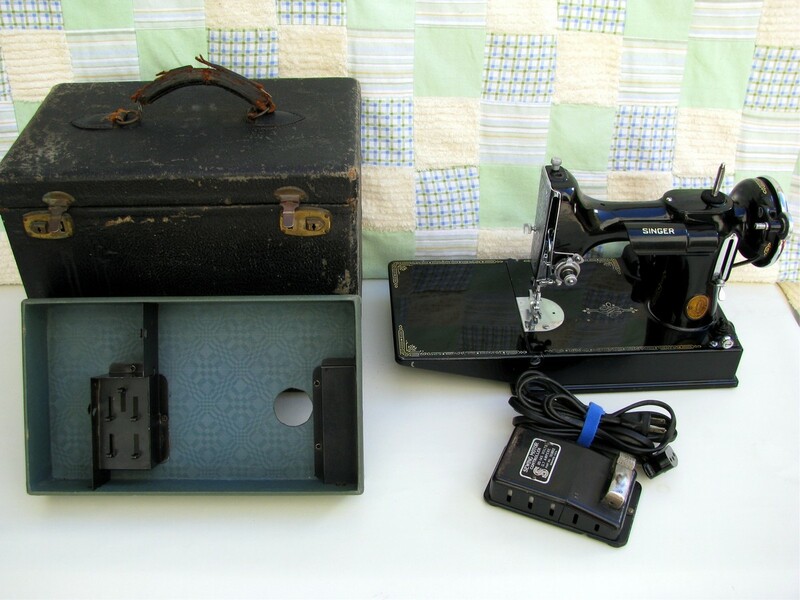 The second machine, AD721468, sold on eBay on September 14, 2010 and we have the photos from the eBay listing, which show the forged serial number, but in this instance the machine appears to at least be from the approximate vintage, including the case/tray, although most likely NOT a real AD machine. The third machine, AD726890, sold on eBay on September 23, 2010 and with this machine I was fortunate enough to be able to communicate with the buyer and was allowed to inspect it thoroughly and photograph the discrepancies. "Thank you for contacting Singer and sending the great pictures! 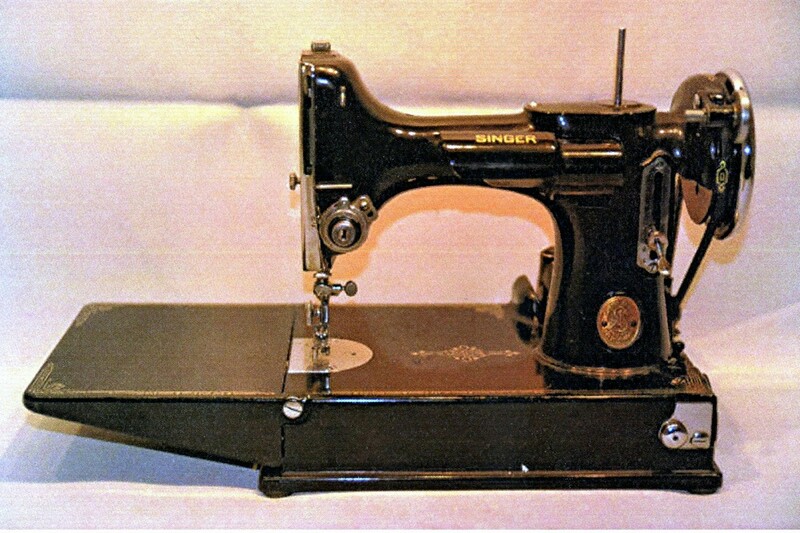 Our records show that serial #AD726890 does belong to Featherweight Model 221, manufactured Sept. 10, 1934. It will be 76 years ond on Friday!" Well the serial number may indicate that it is a 1934, but as you will see from the evidence shown below that is certainly NOT a 1934, but a forgery to try and cheat an unfamiliar buyer into thinking it is a genuine 1934. For the record, I do not believe that the seller was involved with the forgery, but while I did try to point out the discrepancies via email, they choose to believe the note from Singer. 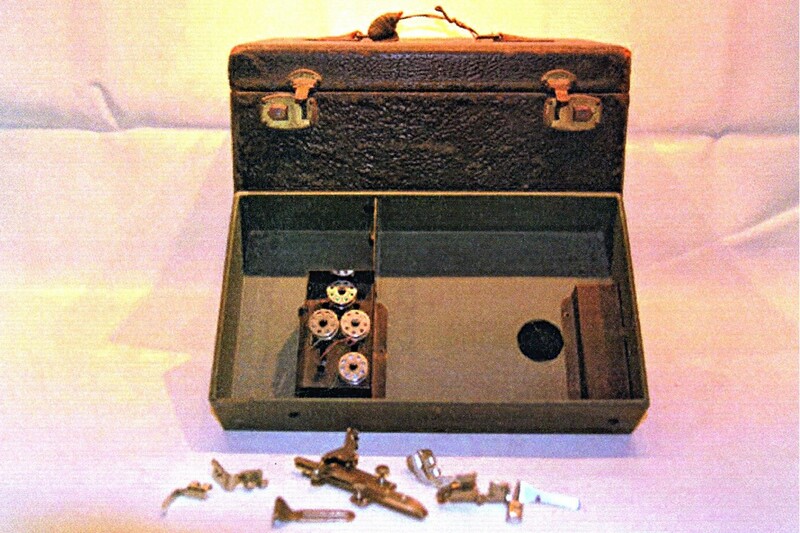 This machine was by far the most blatant of all forgeries, with only the case/tray being from the correct vintage. The machine itself was lacking some of the obvious features of a real AD machine. This is AD726890, but it is NOT a 1934 Featherweight! Whoever did the forgery put a lot of effort into it as the number under the base is also forged. 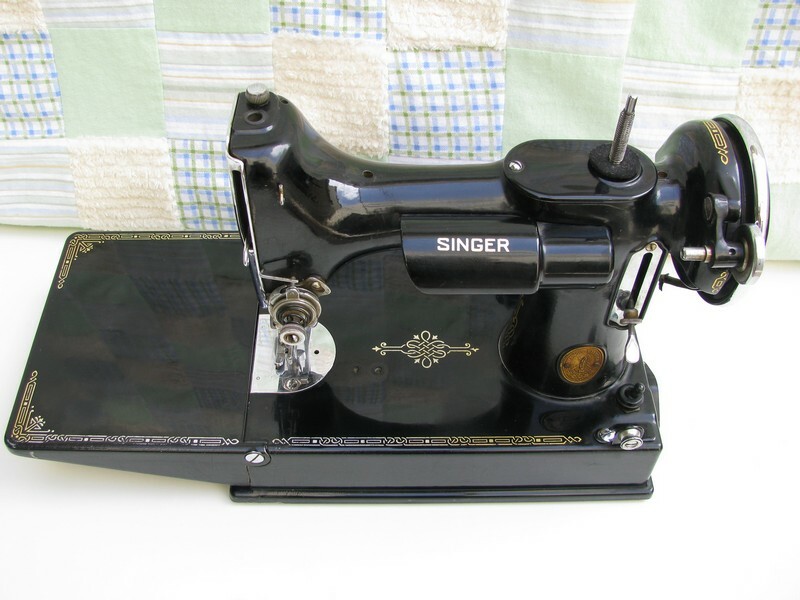 It appears that it is a 1937 AE machine but I just cannot make out all the letters and numbers. 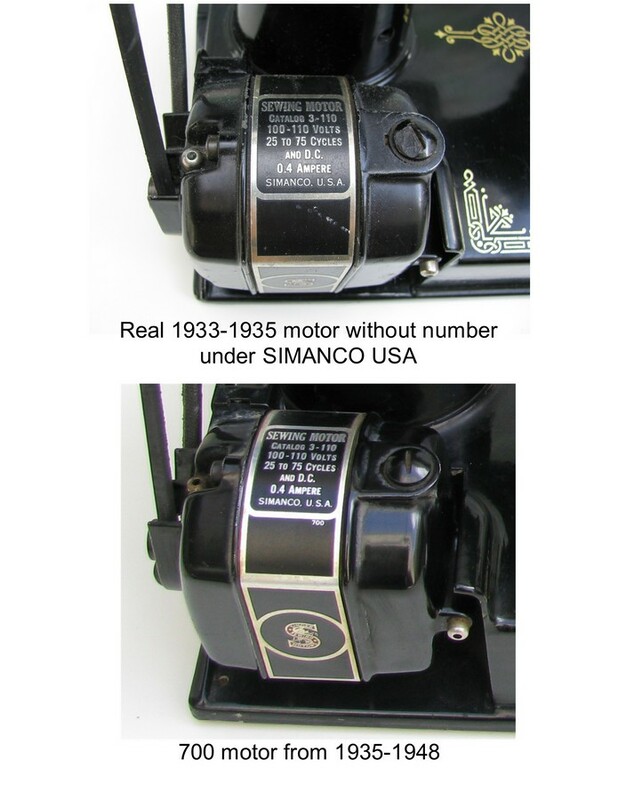 When compared to a real 1934 machine with a serial number that comes from the same production batch, September 10, 1934 and used it as a side by side of the photos I have taken from the forged machine. The differences are very apparent and you should not have any problem seeing the differences. 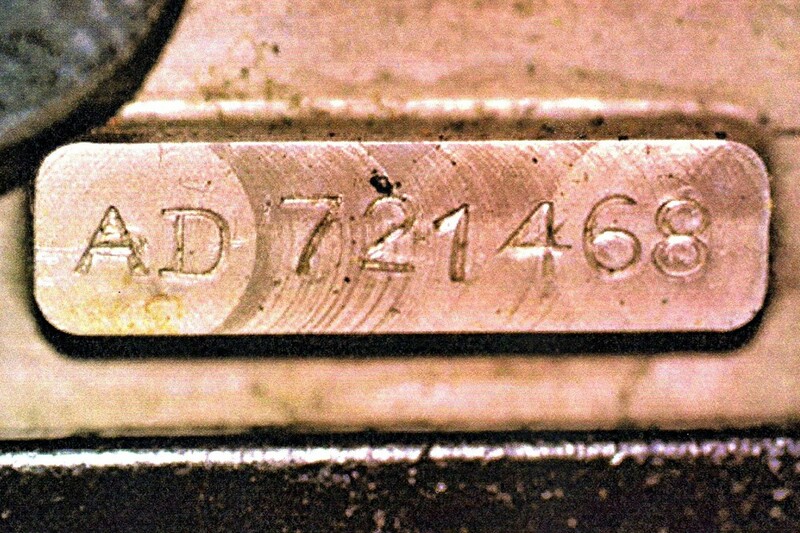 The photo above shows the serial numbers on the bottom of the machine. The SERIAL NUMBER should look like this: NOTE the A and the D...very plain font and the A goes almost straight up like a step ladder. Also note that you can still see the old serial number showing through. Looks to read AE or AF? Hard to tell, but certainly NOT an AD. 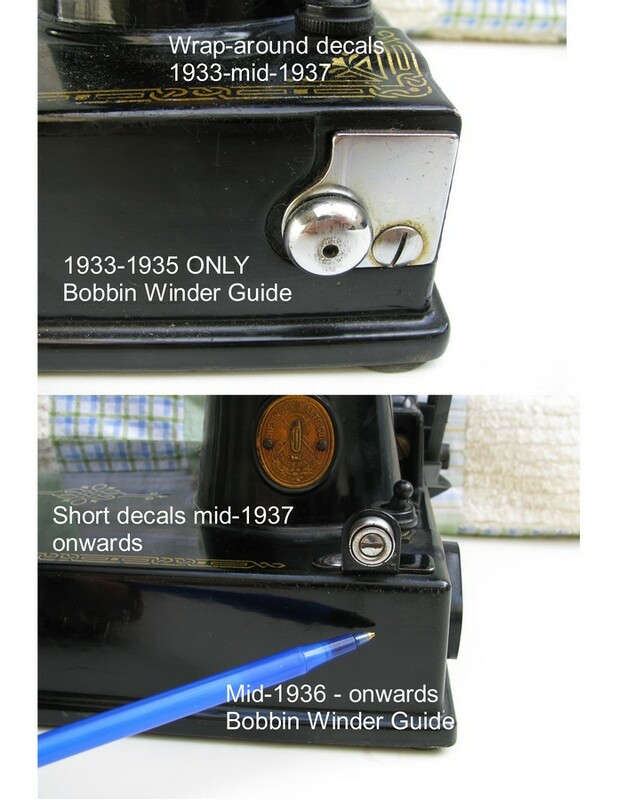 The photo above shows the bed decal and bobbin winder tension placement. Should have a CHROME SIDE MOUNTED Bobbin winder Guide with DECAL going all the way to the LIGHT SWITCH. The photo above shows the split-base. 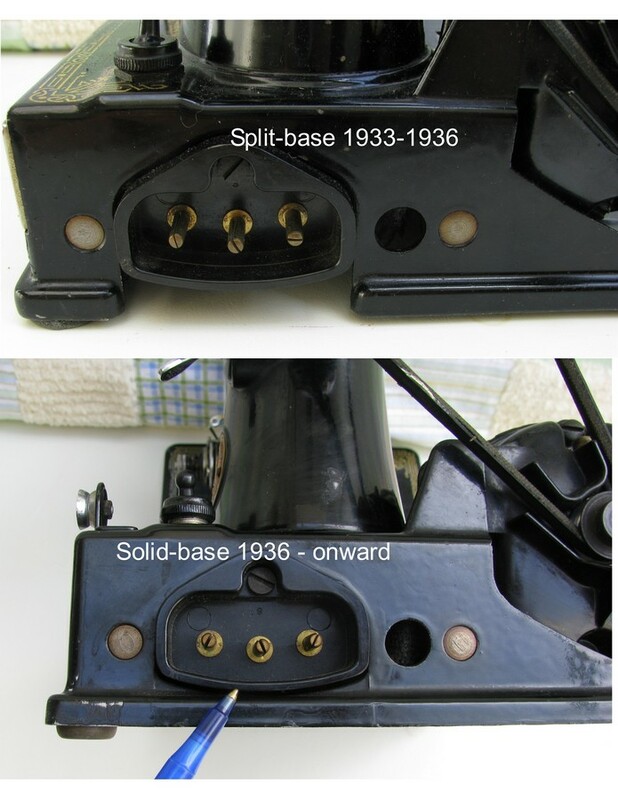 1934 had the split-base. 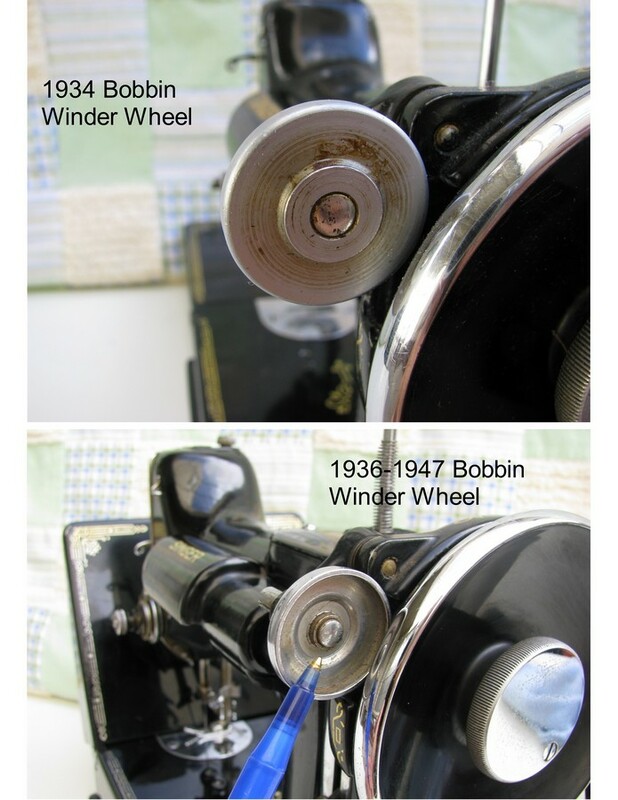 The photo above shows the bobbin winder wheel. 1934 had a solid wheel. 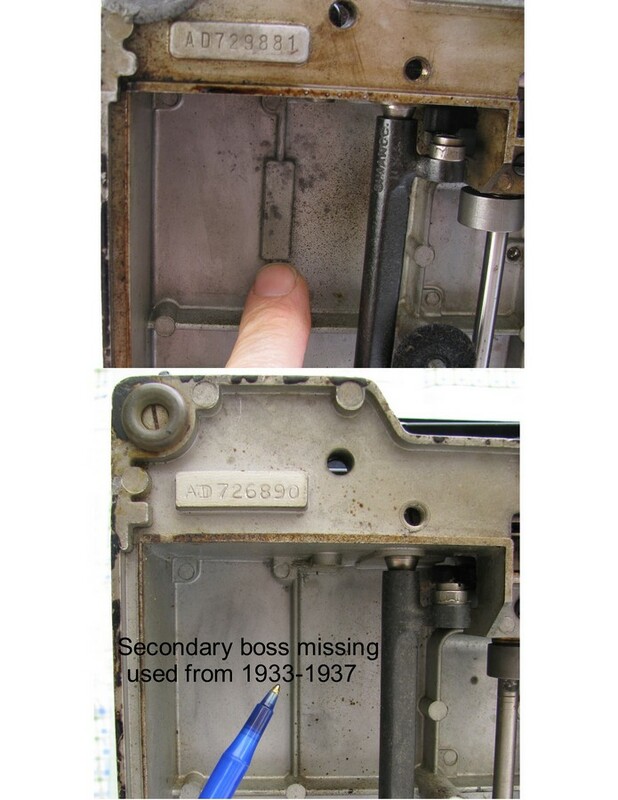 The photo above shows the secondary serial number boss. 1934 should have this boss. 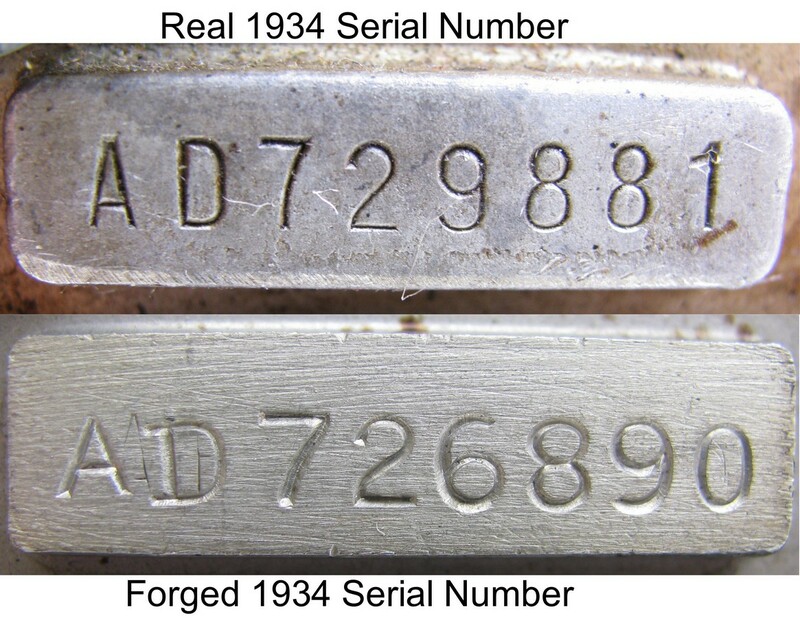 The photo above shows the under-arm serial number. Note the very different font, size and positioning. Again, note that you can still see the old serial number showing through. Looks to read A? Hard to tell, but certainly NOT an AD. The photo above shows the motor. 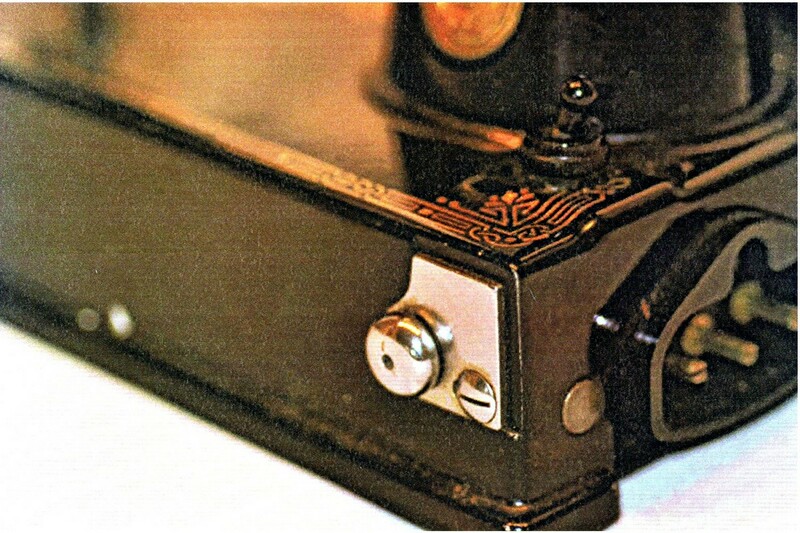 The 1934 did not use the “700” motor. Now, this could be explained away as the old original motor failed and was replaced at some point with a newer production motor from a Singer Service Center. 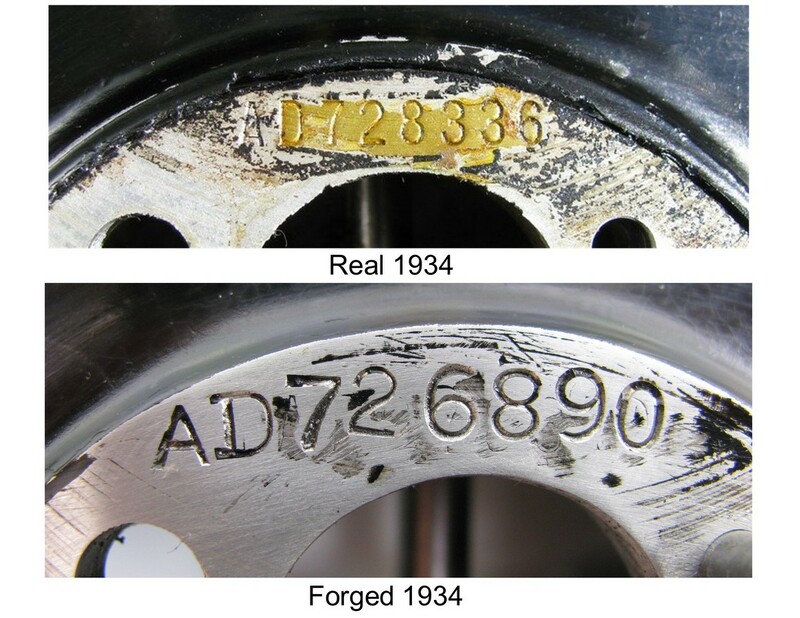 So we hope that this information will help you with evaluating older machines that may be questionable as to their "real" date of manufacture. As we all know, Featherweights are becoming very popular, and as a result there are people out there who will try and take advantage of the unsuspecting. Buyers beware! 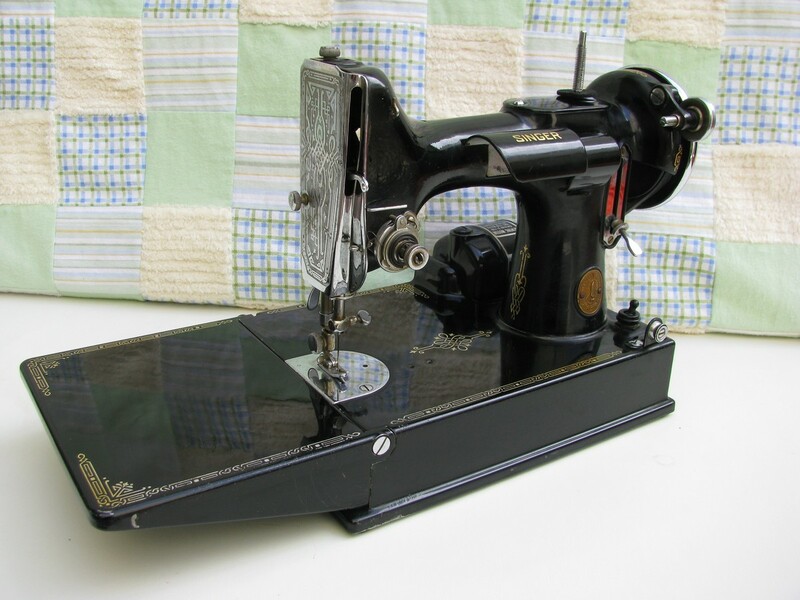 Don't hesitate to contact me if you are in doubt of a machine and either send me photos or direct me to the website that is offering the machine.